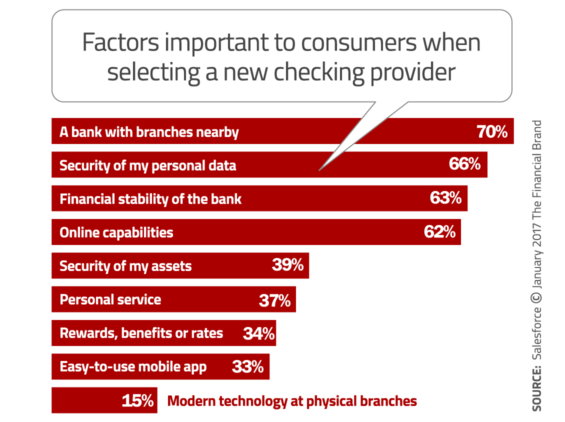 Retail banks and credit unions must brace for the omnichannel reality: consumers say they want digital banking solutions, but they also demand brick-and-mortar branches. They complain that the banking industry isn't innovative, but seem to choose traditional big banks over fintech alternatives. Deciphering these apparent contradictions in consumers' attitudes vs. their actual behaviors amplifies the burden facing financial marketers in the Digital Age. Salesforce surveyed more than 3,000 adults to explore the current attitudes and habits of today’s retail banking customers. The research found that fintech companies are disrupting the banking industry and providing consumers with new ways to borrow and manage their money. Even though consumers aren’t flocking to these new fintech alternatives, banks and credit unions are feeling more pressure than ever to meet the growing expectations of today’s digitally-savvy consumers. To succeed, Salesforce says retail financial institutions must develop customer-centric business models, engage via digital channels, simplify and connect their internal processes — and leverage the right technology tools to personalize relationships at scale. 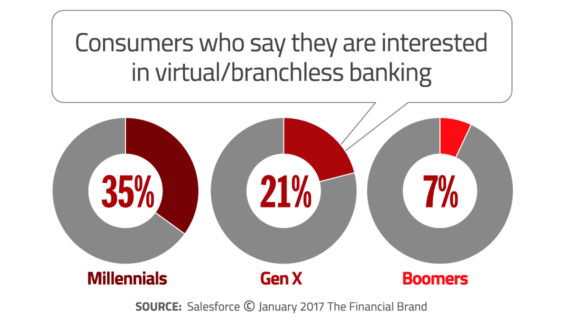 It’s clear from the finding in the Salesforce study that consumers continue to utilize both physical branches and digital channels to perform their routine banking tasks — it’s not a black-and-white, either/or choice. While banks and credit unions have made it easier for consumers to perform routine tasks online and on mobile devices, people still rely frequently on bank branches, with 58% of Americans saying that they have walked into a branch in the last four weeks. 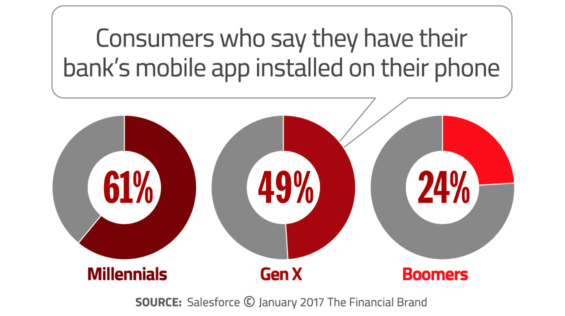 Mobile banking is undeniably the primary channel in which tomorrow’s consumers will interact with their financial institution, with nearly one-third of Millennials (31%) saying they use their bank’s mobile app for routine transactions, compared to just 17% of Gen Xers and 6% of Baby Boomers. As Millennials mature and Gen Z starts to enter the workforce, penetration rates for mobile banking solutions will continue to grow. 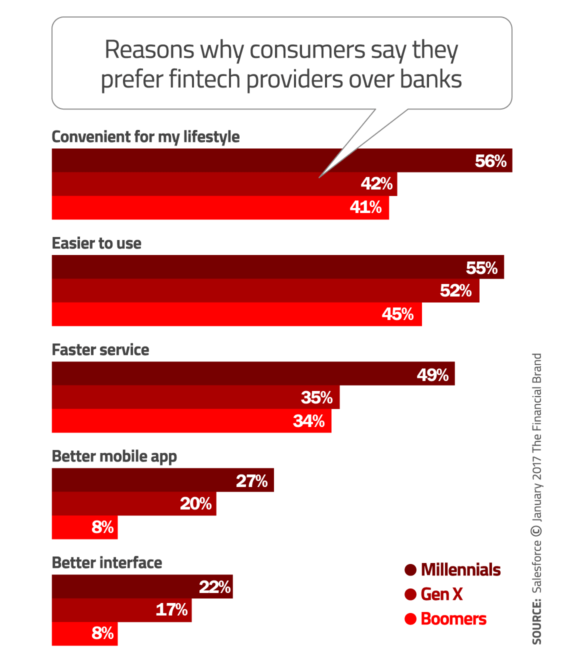 More than half of Millennials (55%) prefer to do basic payment activities using a fintech firm vs. using similar services provided by their banks, highlighting convenience (56%) and ease-of-use (55%) as key reasons for this preference. 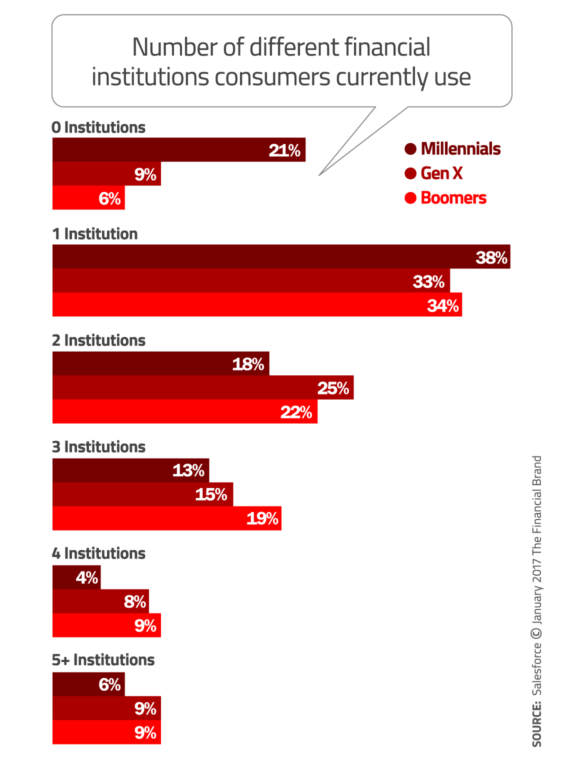 Consumers are increasingly receptive to digital banking innovations and new delivery models — particularly Millennials. One third of all Millennials (35%) are willing to consider an all-digital, completely-branchless provider of retail banking services. One in five Gen Xers are also receptive to the idea. 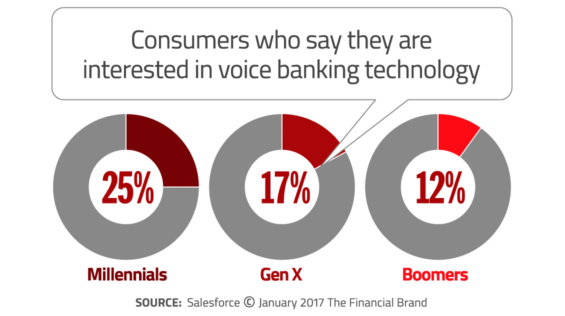 There’s slightly less enthusiasm for voice banking services — i.e. the ability to make payments, report lost credit cards, setup account alerts, and answer a broad range of questions by speaking into your mobile device. That might be explained either by consumers’ level of discomfort stating their banking needs out loud (potentially in front of others), or it could simply reflect their lack of experience/familiarity with the concept. After all, not everyone uses Siri on their iPhones — some because they don’t like it, and others because they don’t how. According to Salesforce, 29% of Millennials have switched banking providers in the last five years — more than Gen Xers (18%) and substantially more than Baby Boomers (8%). 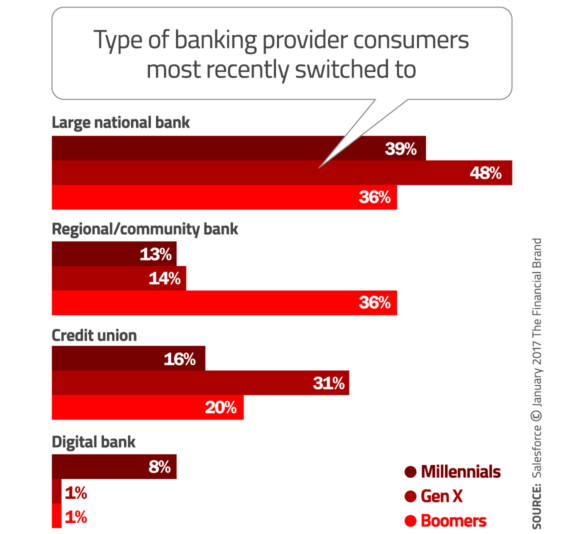 But despite their openness to new ideas and innovations in banking, the majority of consumers fall back to large national banks when they make the switch; very few are choosing digital-only banks. Salesforce attacked consumers’ switching priorities and concerns in two separate questions — both exploring the important criteria that driving their decisions. 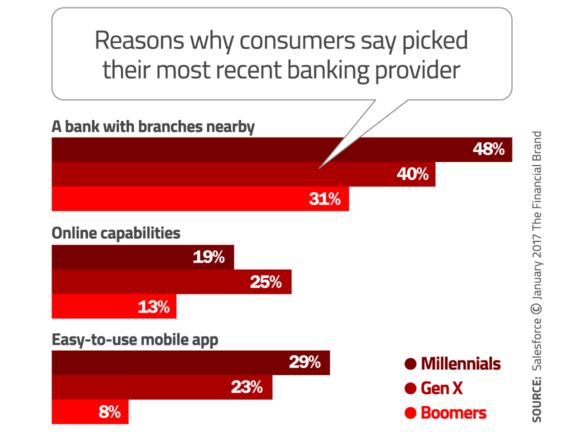 The results from both questions reveal a consistent trend: branches are still a critical factor when consumers select a new banking provider. 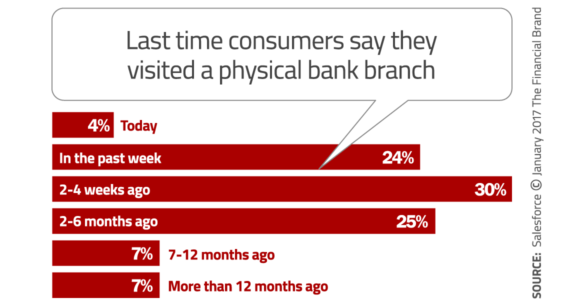 Seven out of ten consumers shopping for a new institutions said it was important that the bank or credit union have physical branches nearby, and roughly four out of ten said it was the factor that influenced them most when they ultimately made the switch. 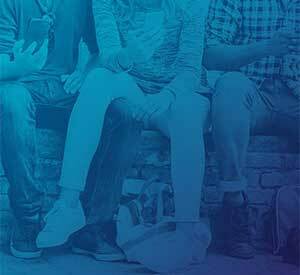 One in five Millennials (21%) in the Salesforce study said they do not leverage any financial institution to address their financial needs, compared to just 6% of Baby Boomers and 9% of Gen Xers who said the same thing. While these self-reported numbers seem to exaggerate the size of the unbanked population, it’s significant that 36% of Americans would like to think they aren’t using a financial institution for any reason. Less than half of Americans who have a checking or savings account (48%) feel strongly that they trust their banking provider with their financial information. Nearly one quarter say they don’t trust that their banking provider has their best interests at heart. Approximately two-thirds of Americans say that the security of their personal data (66%) are important factors when selecting a bank for their checking or savings accounts. In fact, among those who have switched banks in the last five years, one quarter of Millennials (24%) cited the security of their personal data as a reason driving their decision. 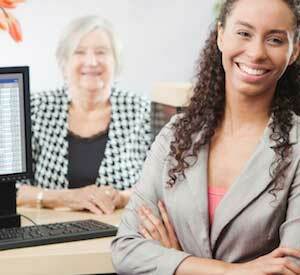 About one in six Boomers and Gen Xers said the same concerns caused them to switch. 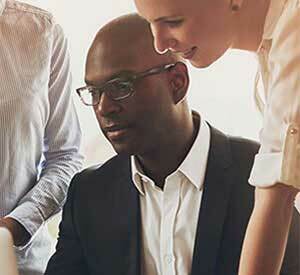 Data is the lifeblood of marketing today. 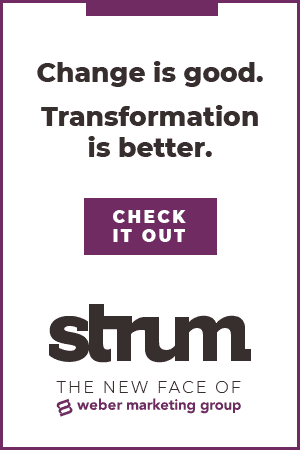 Every time a bank or credit union has an issue with data privacy (e.g., a data breach) or the mass media reports on a compromised system at some big bank, consumers are forced to think about and evaluate the digital integrity of their provider(s). If consumers aren’t comfortable with how financial institutions store and use their data, they might decide to cut off access to it. Reality Check: Financial marketers will face major challenges in the Digital Age if consumers can’t trust them with their data. This article was originally published on January 23, 2017 . All content © 2019 by The Financial Brand and may not be reproduced by any means without permission.